I am trying to allow for a compose key - I would like to type in unicode characters with one keystroke (that is my end goal here). But I cannot seem to enable it. Anyone know how I can enable the compose key, so that I can type unicode characters. On MacOS, I can type alt+j and I get ∆, that's the kind of functionality I am looking for. Compose key behaves a bit differently than you expect. It is not a modifier like Ctrl or Alt which should remain pressed while you typing the rest character(s). 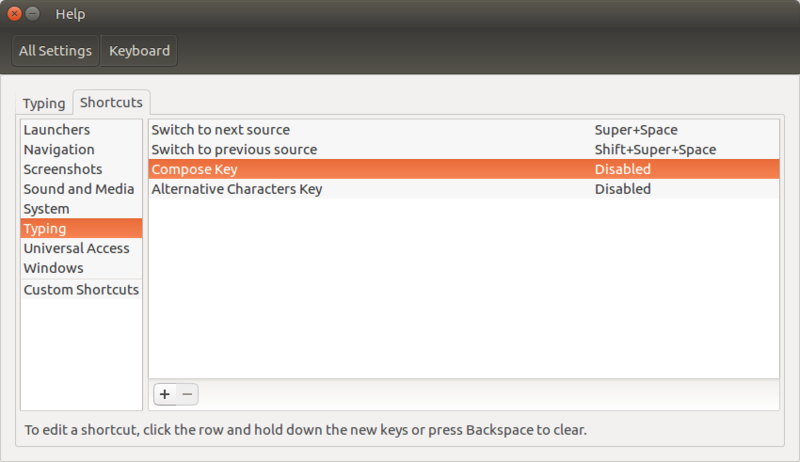 Compose is pressed, then released and the keyboard switches to the state which waits for the additional key sequence. If the key sequence is valid, it is transformed into some Unicode symbol, if it is invalid, keyboard leaves this state and waits for the next keystrokes. For example, to enter Em-dash symbol (long dash) I should press Compose, -, -, - sequentially. Valid sequences can be found here. And one more source: /usr/share/X11/locale/en_US.UTF-8/Compose (this one is huge). In order to set Compose key, press Disabled word to the right of Compose in the window you provided in your question. Then press the button which will take over Compose function. For example, I use Menu button, which isn't used too often. It is located between right Super (with window logo) and right Ctrl. Close the window and try some Compose combination in any editor. To create sequences for your own need, you also can follow these instructions . For greek letter in mathematics context, you may also simply reuse proposals you can found here. To get effects, you have to restart your desktop environment. For information, %L refers to your current keyboard mapping /usr/share/X11/locale/en_US.UTF-8/Compose. Remark: WinCompose tool allows to get same intuitive behavior on Windows system. Not the answer you're looking for? Browse other questions tagged keyboard shortcut-keys unicode unicode-entry compose-key or ask your own question. Using Alt Codes in Skype? how to enable compose key in cinnamon?